Alliance Française de Dhaka, in collaboration with Alliance Française de Chattogram, will organise an exceptional musical programme styled ‘Trans-portées / Scale to Scale’ at the National Theatre Hall of Bangladesh Shilpakala Academy on March 8 at 6:30 pm. The musical event will be an exceptional one as there will be a juxtaposition of traditional Bangladeshi music and the contemporary creations of the French composer Laurent Cuniot while the two sides will have a musical dialogue between them. 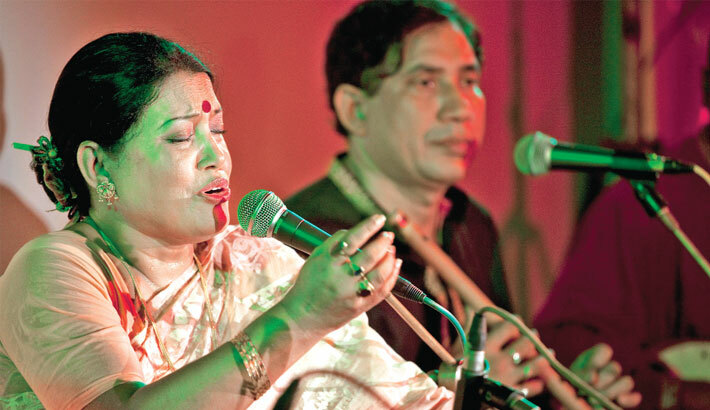 Legendary Bangladeshi singer Farida Parveen will perform Bangla songs along with her musicians while Hadhoum Tunc and the musicians of the French ensemble TM will perform their songs at the event. A poetic dialogue will also take place at the event based on the texts of mystic philosopher Lalon Shah and the contemporary poetry of Muhammad Mansur. People at large tend to associate Farida Parveen with Lalon songs in their minds whenever they come to talk about the popular singer. Farida is even known as the ‘Queen of Lalon Song’ for her immense contribution to the contemporary diffusion of the poetry and thoughts of Lalon Fakir. She was awarded Ekushey Padak in 1987 by the government of Bangladesh. Meanwhile, TM has made a name for itself as one of the first French ensembles dedicated to contemporary and classical repertoires since its first concert that took place in 1986 at Radio France under the baton of Laurent Cuniot. The entry is free and on a first-come, first-served basis.